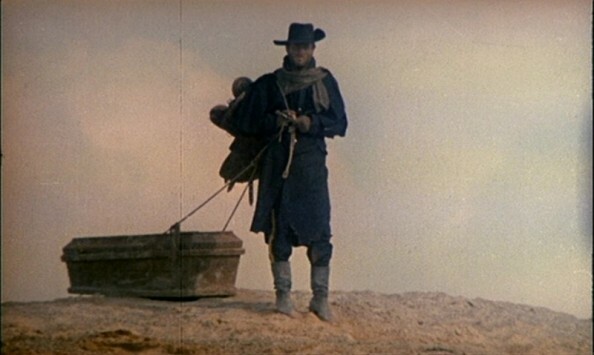 To celebrate the release of a box-set including Django, Keoma and A Bullet for the General, we have an article on Italian Westerns. We also look at Glauber Rocha’s take on the holy bandit, Antonio das Mortes, and admire Ennio Morricone’s soundtrack to Corbucci’s The Great Silence while writer Patrick Hargadon imagines being Yul Brynner as The Gunslinger in Futureworld. We interview Claire Denis who revisits Africa in White Material, and Catherine Breillat who reworks the classic fairy tale Bluebeard. Other cinema releases include Christopher Nolan’s dream thriller Inception, Splice by Cube director Vincenzo Natali, French musical genius biopic Gainsbourg, and original British gangster movie Down Terrace. Watch the Splice trailer and the Brothers McLeod’s new animated film. In the new DVDs, we review Imamura’s stunning epic Profound Desires of the Gods and George A Romero’s vampire satire Martin gets the comic strip treatment. This month’s Colonial Report from the Dominion of Canada looks at Alain Cavalier’s neo-noir Le combat dans l’Ã®le. In the Short Cuts, we review the Edinburgh Film Festival’s shorts programmes, including Maska, the new film by the Brothers Quay. In the Jukebox, Danish film score composers Cours Lapin, who mix chanson franÃ§aise and twisted fairy tales, tell us about their favourite films. In the blog, we have reviews of the Istanbul Film Festival, the latest Secret Cinema event and the Edinburgh Film Festival. PODCAST: alt.cowboy: Alex Fitch talks to BFI programmer Emma Smart about gay themes in Westerns after a screening of Midnight Cowboy and to Ian Rakoff about the crossover between Western-themed comics and movies before a screening of For a Few Dollars More.